Swipe to Win – Buzz Points! 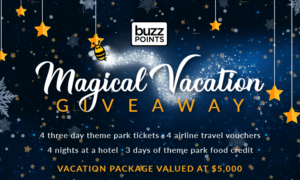 The Family Credit Union and Buzz Points wants your family to win a magical vacation this holiday season! Swipe for your chance to win a family vacation to a magical Orlando, FL theme park this holiday season! Vacation package valued at $5,000! How to Enter: During the month of September, every swipe you make over your monthly average will enter you into the sweepstakes! Your card has to be linked to your TFCU debit card to win. It’s that simple.